This is a continuation of my previous post titled Installing IIS 7.5, A number of Web services that were previously available as separate downloads are now integrated into IIS in Windows Server 2008 R2, as described in the following sections . Web-based Distributed Authoring and Versioning (WebDAV) is an IIS extension, now implemented as a role service called WebDAV Publishing, which expands the capabilities of the Hypertext Transfer Protocol (HTTP) by making it possible for administrators and users to publish documents on Web sites simply by copying them to a mapped network drive. After installing the role service, you create an authoring rule that specifies what content you want to be able to publish and which users can publish it, using the interface shown. Then, using a feature called the WebDAV redirector on the client computer, you map a drive to your Web site. Copying files to that drive automatically publishes them on the Web site. Standard compliance - The WebDAV implementation in IIS 7 .5 is fully compliant with the Request for Comment (RFC) 4918 standard published by the Internet Engineering Task Force (IETF) . Site-level support - Unlike earlier versions, you can now enable WebDAV publishing at the site level, instead of on the entire server . Support for HTTP over SSl - This enables clients to publish documents securely by encrypting transmissions using the Secure Sockets Layer (SSL) protocol . Supports for locks - The WebDAV in IIS 7 .5 supports both shared and exclusive locks to prevent lost updates due to overwrites . Per-URl authoring rules - This enables administrators to specify WebDAV security settings for individual Uniform Resource Locators (URLs) . This provides the ability to create different sets of security parameters for standard HTTP requests and WebDAV authoring . File Transfer Protocol (FTP) is one of the early protocols in the Transmission Control Protocol/Internet Protocol (TCP/IP) suite . It was created at a time when security was not as great a concern as it is now, and as a result, it has no built-in data protection of any kind . Clients transmit passwords in clear text, and transfer files to and from servers in unencrypted form . Windows Server 2008 R2, however, has an FTP server implementation that is enhanced with better security measures and other new features . FTP over Secure Sockets layer (SSl) - Enables the FTP server to establish secure connections using password protection and SSL data encryption. Combined FTP and Web hosting - Enables a single IIS site to support both HTTP and FTP connections. Virtual host naming - Enables a single IIS server to host multiple FTP sites using a single IP address and port number, distinguishing between the sites by using host names, just as it can with Web sites. 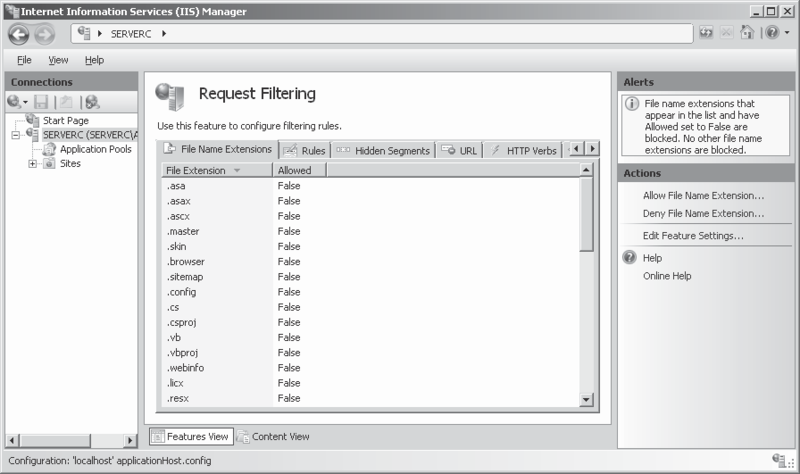 Improved logging and error handling - IIS log files include additional fields for FTP connections, and IIS can generate detailed error messages for clients on the local network. 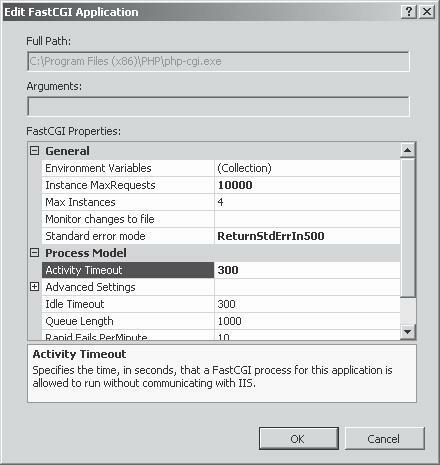 Now, in Windows Server 2008 R2, Microsoft has fully incorporated that FTP Publishing Service into IIS 7.5, so there is no need for a special download and no need to install an outdated management console. They have also included an additional role service, FTP Extensibility, which enables developers to use their own managed code to create customized authentication, authorization, logging, and home directory providers. Windows Server 2008, Microsoft introduced Internet Information Services (IIS) 7 .0, a major architectural update to its Web and application server platform . Since then, as anticipated, the IIS development team has been working on a variety of enhancements and extensions that build on that new architecture . Now, in Windows Server 2008 R2, Microsoft introduces IIS 7 .5 . Although based on the same basic structure as IIS 7 .0, this new version includes numerous new features and refinements . This chapter lists the new features in IIS 7 .5 and explains how they enhance the capabilities of the Web and ap- plication server platform . 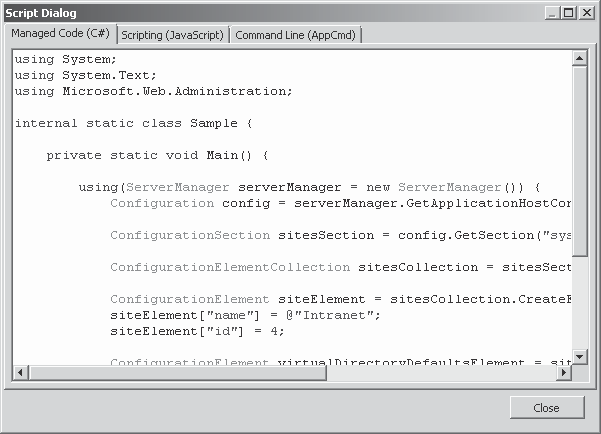 The Web Server (IIS) role in Windows Server 2008 R2 is only slightly different in appearance from that in Windows Server 2008. 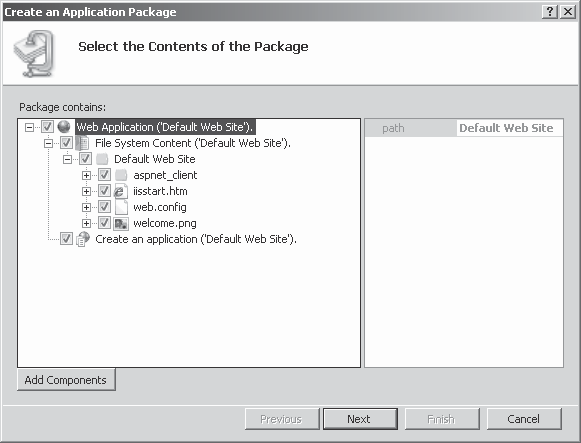 When you select the role in the Add Roles Wizard, the Add Features Required For Web Server (IIS) dialog box does not appear and prompt you to install the Windows Process Activation Service (WPAS) feature, as it didin Windows Server 2008. That dependency is still there, however. 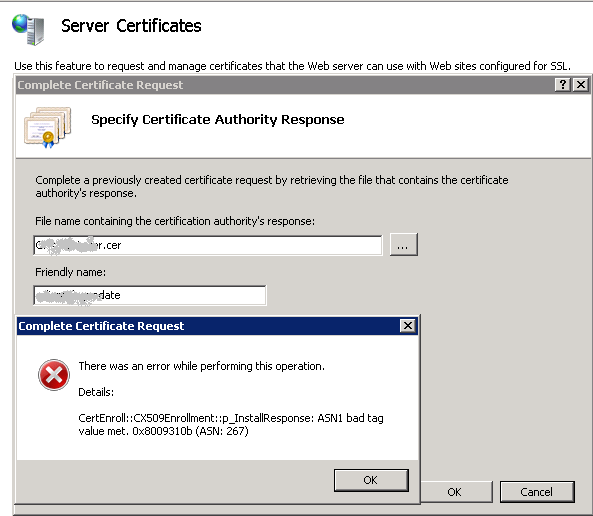 Even when you don’t explicitly install WPAS, IIS 7.5 starts the service as needed. WebDAV Publishing, Enables users to publish content to IIS Web sites inter-actively and securely. For more information, see the section “Using IIS WebDAV,” later in this chapter. FTP Server, Enables users to transfer files to and from an IIS server and perform basic file management tasks. 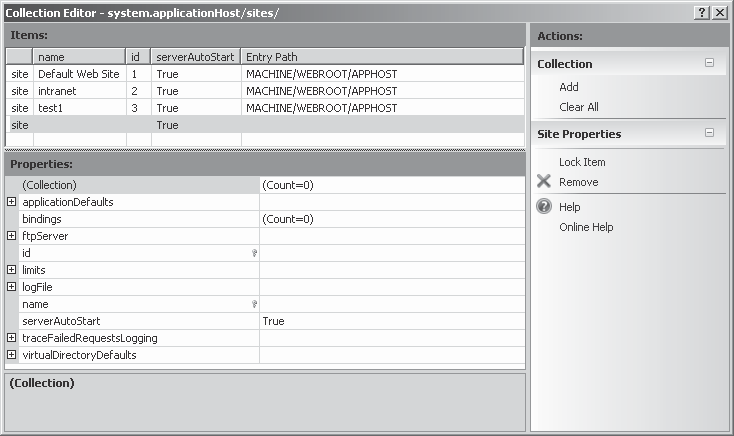 IIS Hostable Web Core, Enables developers to integrate IIS request handling functionality into their own applications . 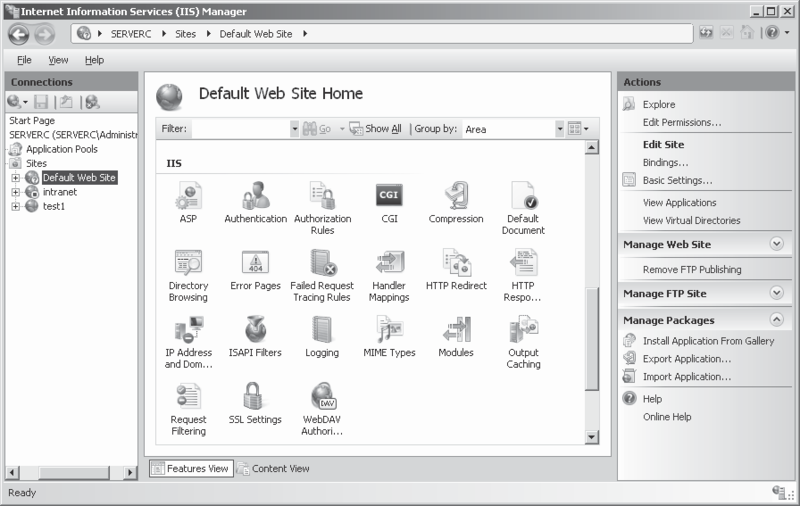 WebDAV Publishing and FTP Server were both add-on products for IIS 7 .0 that administra- tors had to download and install separately. Now, in Windows Server 2008 R2, they are both fully integrated into the Web Server (IIS) role, and you can install them as part of IIS 7.5. Although Windows Server 2008 R2 administrators can still install IIS and create Web sites in the traditional manner, using the Server Manager and Internet Information Services (IIS ) Manager consoles, Microsoft now provides another way. The Microsoft Web Platform is an integrated set of servers and tools that enable you to deploy complete Web solutions, includ- ing applications and ancillary servers, with a single procedure. 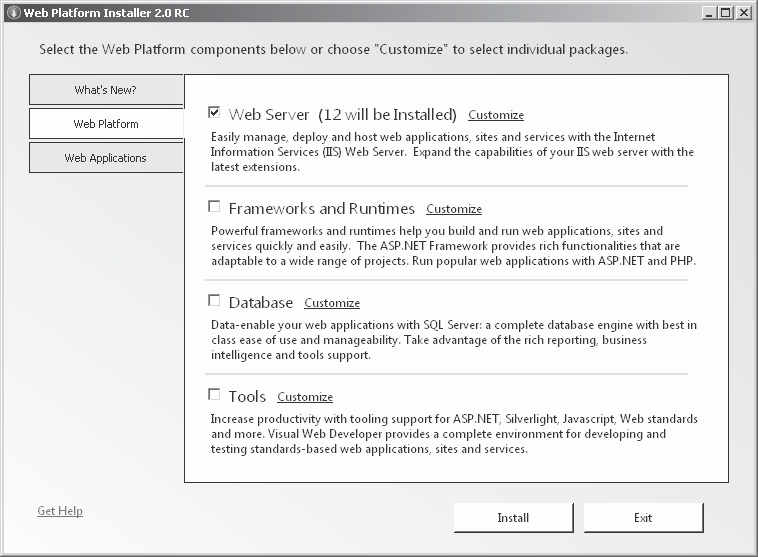 The Microsoft Web Platform Installer is a tool that enables you to select, download, install, and configure the features you want to deploy on your Web server. The Web Platform Installer file you download is a stub, a tiny file that enables you to select the modules you want to install and then to download them, using the interface shown in Figure 7-1. Unlike the Web Server (IIS) role in Windows Server 2008 R2, the Web Platform Installer enables you to download other servers and applications that are produced by Microsoft and third parties. The installer provides a selection of collaboration, e-commerce, portal, and blog applications, and enforces the dependencies between the various elements. If, for example, you select an application that requires a database, the installer will download and install SQL Server Express 2008, Microsoft’s free SQL database product. During the installation process, Web Platform Installer prompts you for information needed by your selected applications, such as what subdirectory to install them into, what passwords to use, and so on. When the process is complete, you have a fully functional Web site, complete with IIS and applications and ready to use . 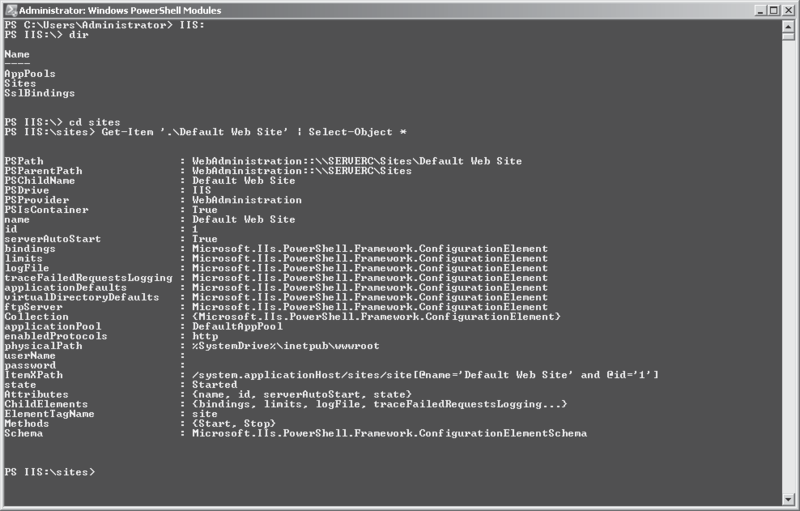 The Web Deployment Tool (formerly called MS Deploy) is an IIS extension that enables administrators to package entire Web sites, Web servers, and applications for deployment on other computers, or just for backup purposes. Packages include all of a site’s content, includ- ing configuration settings, permissions, databases, and certificates. 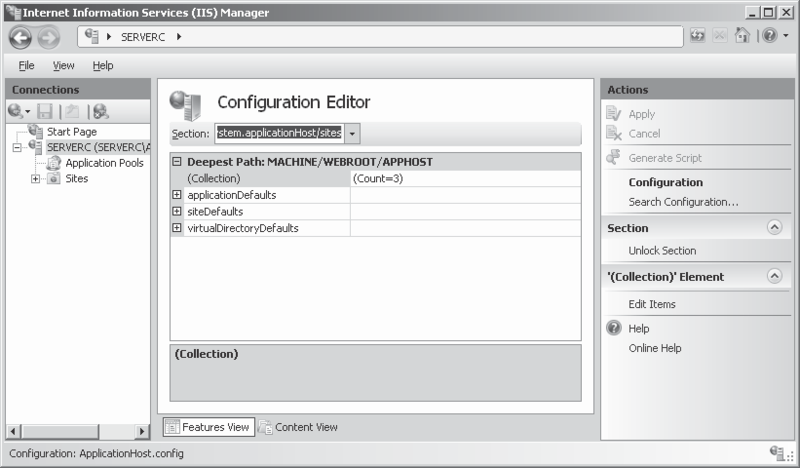 When you run the Web Deployment Tool offline, it adds a Manage Packages section to the Actions pane of the Internet Information Services (IIS) Manager console.